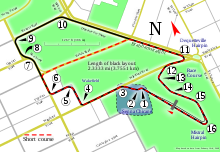 The 1987 Australian Grand Prix was a Formula One motor race held at Adelaide on 15 November 1987. It was the sixteenth and final race of the 1987 Formula One World Championship. The 82-lap race was won by Austrian driver Gerhard Berger, who started from pole position and led every lap in his Ferrari. Brazilian Ayrton Senna finished second in his Lotus-Honda but was subsequently disqualified, thus promoting Berger's Italian teammate Michele Alboreto to second and the Benetton-Ford of Belgian Thierry Boutsen to third. Ferrari's Gerhard Berger started from pole position despite being ill during qualifying. Nigel Mansell was still recovering from his accident in the previous race in Japan and so Riccardo Patrese, who had already signed for Williams to partner Mansell in 1988, was given permission by Brabham owner Bernie Ecclestone to stand in for the Englishman in this race; he was replaced at Brabham by Formula 3000 champion Stefano Modena, making his Formula One debut. At the green light, it was Nelson Piquet, in his last race for Williams before moving to Lotus in 1988, who got away best of all, darting past Berger to take the lead into the first chicane. Alessandro Nannini in the Minardi was out immediately after crashing into the wall. A confident Berger, fresh from his victory in the previous race in Japan, re-passed Piquet going into turn three. The Austrian then went on to lead until the chequered flag to claim his third Grand Prix victory. Behind Berger developed a sparkling battle between Piquet, Alain Prost (McLaren), Michele Alboreto (Ferrari) and Ayrton Senna (Lotus). Piquet pitted for new tyres and later retired leaving the other trio to fight over second position. Senna eventually made a break from Alboreto and Prost who were being held up by back markers, with the Larrousse of Philippe Alliot in particular proving difficult to pass. Prost suffered brake failure on lap 53, spinning off into the wall at Stag Turn and subsequently retiring. He had earlier jumped over a chicane when behind Alliot. Senna made a late charge in an attempt to catch Berger, but the Austrian had enough in hand to respond despite having what appeared to be a dragging under-tray. Senna finished second but was later disqualified when post race scrutineering revealed oversized brake ducts on his Lotus. Alboreto was promoted up to second to make it a Ferrari 1-2, the first since Alboreto and Stefan Johansson finished 1-2 in the 1985 Canadian Grand Prix. Third across the line was the Benetton of Thierry Boutsen. Of the races seven finishers (the Brabham of Andrea de Cesaris and the Williams of Patrese were classified as finishers despite not running at the end), Alboreto was the only driver to not be lapped by Berger. The first non-turbo car to finish was the Tyrrell of Jonathan Palmer in 4th place. Frenchman Yannick Dalmas finished 5th in his Larrouse, with triple Australian Grand Prix winner Roberto Moreno (1981, 1983 and 1984) scoring a point in his Formula One debut with AGS by finishing 6th. The last car to cross the finish line was the Zakspeed of Christian Danner in 7th place, 3 laps down on Berger. * Dalmas did not receive points towards the Drivers' Championship or the Jim Clark Trophy, as he was driving Larrousse-Lola's second car and the team had officially entered only one car for the entire championship. 3rd Grand Prix victory for Gerhard Berger, and Berger's only career Grand Chelem. It was also the 93rd win for Ferrari. With Berger also winning the previous round in Japan this saw Ferrari win back to back races for the first time since Gilles Villeneuve won the Monaco and Spanish Grands Prix in 1981. 68th and final Grand Prix start for the TAG-Porsche engine. 97th and final Grand Prix start for the BMW M12 engine, though the engine itself would live on until the end of 1988 badged as a "Megatron" and used by Arrows. 30th and final Grand Prix start for the turbocharged Ford TEC engine. 44th and final Grand Prix start for the Motori Moderni engine. 64th and final Grand Prix Start for Teo Fabi. 1st Grand Prix start for the 1987 Formula 3000 champion Stefano Modena. ^ "Foster's Australian Grand Prix - QUALIFYING 1". formula1.com. Retrieved 2 May 2018. ^ "Foster's Australian Grand Prix - QUALIFYING 2". formula1.com. Retrieved 2 May 2018. ^ "Foster's Australian Grand Prix - OVERALL QUALIFYING". formula1.com. Retrieved 2 May 2018. ^ a b According to Anthony, Pritchard (March 2006). Lotus: The Competition Cars. Haynes Publishing. p. 246. ISBN 1-84425-006-7. , Senna finished second, but oversize brake ducts noticed at post-race scrutineering. ^ "1987 Australian Grand Prix". formula1.com. Archived from the original on 10 December 2014. Retrieved 23 December 2015. ^ a b "Australia 1987 - Championship • STATS F1". www.statsf1.com. Retrieved 6 March 2019.